"Centro Atlántico de Arte Moderno CAAM". Antoni Muntadas: "Stuttgart (for H. H.)"
Marcel Odenbach: "Los cocodrilos acechan en aguas tranquilas"
Martha Rosler: "Prototype (God Bless America)"
Produced by : Centro Atlántico de Arte Moderno - CAAM. From the 29th of October 2008 to the 25th of January 2009, the Sala San Antonio Abad of the Centro Atlántico de Arte Moderno - CAAM, presents Present Tense, an exhibition curated by Berta Sichel which brings together the video works of five international artists from two different generations: Stéphanie N'Duhirahe (Geneva, 1984), Omer Fast (Jerusalem, 1972), Antoni Muntadas (Barcelona, 1942), Marcel Odenbach (Cologne, 1953) and Martha Rosler (New York, 1943), and which forms part of the programme of Canariasmediafest (International Arts and Digital Cultures Festival of Gran Canaria). The show sets out to reflect the instability that we have incorporated into the routine of our daily lives, a routine in which we accept ambiguity and uncertainty with an amazing degree of confidence. 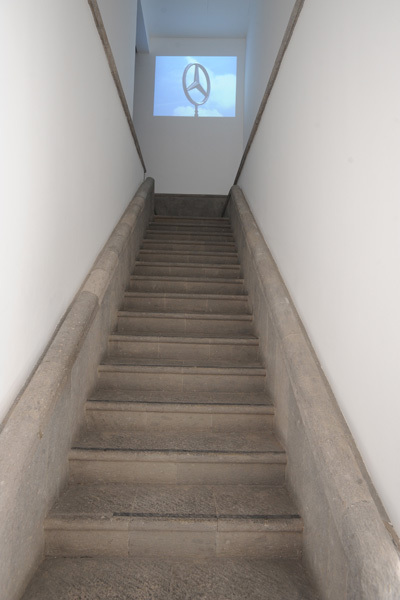 According to Berta Sichel, the priority when selecting the works for this project was "to seek an alternative: not through "spectacle", but through representations that could transmit the tensions of the present tense in a more eloquent, thought-provoking way - perhaps one of the few options left if we want to open up a window onto the present". To look closely at the world is to understand the subtle connections between the apparent stability of our daily routine and the complex undercurrents which (surprisingly) keep the modern state afloat. Present Time reflects the possibilities and challenges of visually representing mobility, displacement, the circulation of people and cultures, globalisation and exclusion. Each of these themes is characteristic of a new geopolitical era which, according to numerous articles and books, started with the terrorist attacks of 9/11 and their dissemination. The atrocious spectacle of 9/11 produced an image worth a million, rather than a thousand, words. In a question of minutes, its image had travelled all around the world, instantly becoming the icon of our current geopolitical age. For many, the events of September 11 were sufficient to destabilise governments and societies living under a pseudo - although nonetheless powerful - state. Take, for instance, the fall of the Berlin wall, the consolidation of the European Community and the economic power of the United States; all of this shaped the fantasy of our current cosmopolitan, stable lives. In the past, the solidness of terra firma (the dry land that sailors dreamed of waiting for them at the end of their stormy Atlantic crossings) represented safety. Today, however, treading solid ground no longer calms our anxieties. How could this new situation be reflected in the creation, public reaction to, and understanding of contemporary art? The image and electronic media are probably the most appropriate means for artistically and aesthetically reproducing the environment of Present Time. Communication technologies and telecommunications, and the emergence of the global marketplace - including the art market, have opened new roads, relentlessly and rapidly accelerating the process of cultural exchange and global circulation. In fact, these roads have been in existence for centuries, but, in the words of theorist and author Irit Rogoff, whose book gave this project its name, "we simply did not have the means and awareness by which to narrate this process." The consequences of the war against terror are one way of narrating the process. War is a key part of this jigsaw of instability and mobility. Consider, for instance, the millions of people forced by conflicts to leave their countries. The works selected for Present Tense are not intended to deal with questions of war. This omission is an intentional one, since images of war have already saturated our collective imagination. While selecting the works for this exhibition, the curator's priority was to seek an alternative: not through "spectacle," but through representations that could transmit the tensions of the present tense in a more eloquent, thought-provoking way. The concepts which could most easily be communicated, or simply through pictures of suicide terrorists or families living in refugee camps, here, in Terra Infirma, for example, ask the spectator to take the time to delve beneath the layers of absolute complexity. With no intention of reaching any conclusions, leaving many doors open not only for interpretation but also for complementing and expanding, Present Time presents images and narratives created by a group of international artists who recontextualise the incomprehensible logic (if indeed it can be said that any exists at all) of this new political-geopolitical age. How do we feel about current events? About the world in which we live? About others? And about artistic practices? 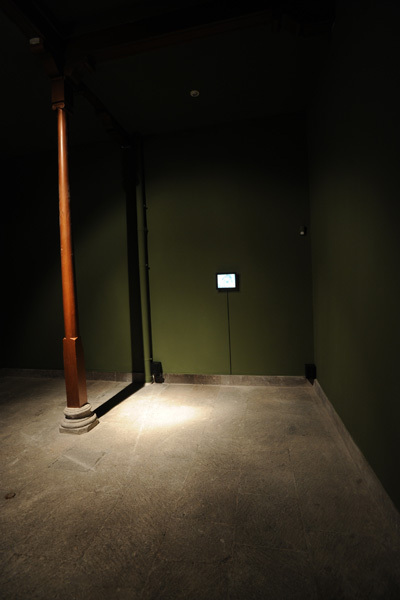 By insisting on the relative autonomy of culture and by exploring - through art -the specific interstices within political and economic structures, this exhibition supposes a shift in emphasis from culture itself to cultural politics: a place where meanings are negotiated and the relationships of predominance and subordination are defined and contested. Martha Rosler presents a single-channel video, made in 2006, lasting one minute and entitled Prototype (God Bless America). Martha Rosler is one of the most important and incisive cultural critics of contemporary art. 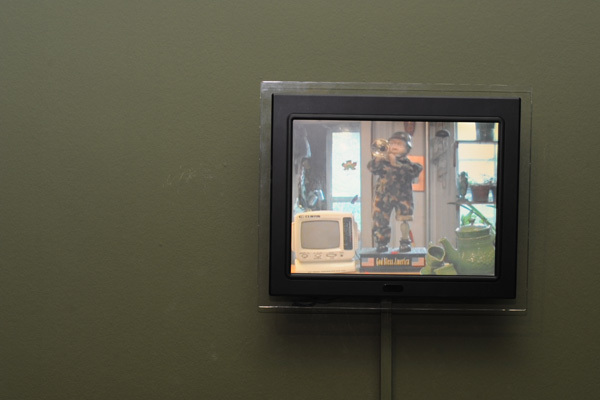 In her videos, Rosler investigates how social realities and political ideologies dominate everyday life. In this new video work, Prototype (God Bless America), her reflection is brief but penetrating. A mechanical doll dressed as an American soldier plays the anthem God Bless America on a trumpet. The camera focuses on the lower half of the doll and shows that one leg of his camouflage trousers are rolled up, revealing a mechanism which uncannily resembles the prosthesis of an amputated leg. Stéphanie N'Duhirahe presents Sans Titre (Untitled), a video performance, made in 2006 and lasting nearly nine minutes, in which the barefoot artist performs a balancing act whilst crossing a large concrete room in which a sea of domestic and everyday objects are scattered across the floor: plates, cups, ashtrays, empty detergent bottles, household appliances. She somehow manages to keep her balance whilst crossing the stepping-stone path, without her feet touching the ground at any time. Always about to fall, but always keeping her balance, the artist transforms the delicacy of her own position into an evocative symbol of the fragile nature of life. Omer Fast presents the 18-minute video put together in 2002, CNN Concatenated, in which the artist creates a database of ten thousand words taken from recordings of CNN news readers and commentators between 2001 and 2002, rearranging the fragmented words into existential monologues which talk directly to the spectator. The result is a highly personal, although easily influenced, call for attention. If there is a speaker behind the monologue, it is a voice which attempts to fill in that which the sequence of news items cannot relieve, and which even exploits: more than the need to know and understand, the need to see and observe, to have a stable context which helps to understand the information, to hold a memory, to create a community, have privacy, act, flee, enjoy silence and seek meaning. Marcel Odenbach exhibits a piece of work completed between 2002 and 2004, entitled In stillen Teichen lauern Krokodile (In still waters lurk crocodiles). A certain part of the work of Marcel Odenbach is fuelled by his research and trips through countries such as Cameroon, South Africa, Ghana and Rwanda, during which time he reflects upon the forms adopted by visual representations of the African continent, particularly in western media. Whilst working in the film archives of the United Nations, Odenbach came across film stock documenting the acts of genocide perpetrated in Rwanda in 1994. This find became the starting point for the process of creating a corpus in which the artist proposes a personal reflection on the indescribable violence of that ill-fated episode and the consequences it had for the people of that country. 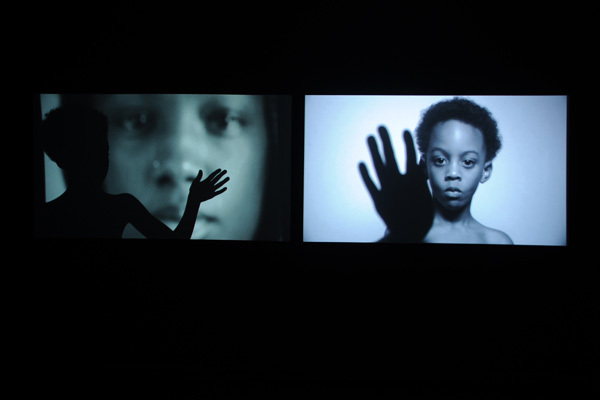 Referring to the work, Odenbach describes it as "a subjective documentation of a drama in seven chapters" that evokes this turbulent period in the recent history of Rwanda through a rich montage bringing together more than thirty minutes of archive material and recently filmed video footage. In relation to working with found material (the cycle of finding, recompiling and, finally, using the images), Odenbach describes the peculiar situation of the collector, affirming that "he who possesses something also carries a burden, in this case a burden which is not just material, but also emotional". A burden or responsibility that, through the act of making that material public, is also transferred - at least in part - to the spectator, via their participation in a critical process of contemplation, questioning and collective memory. Finally, Catalan Antoni Muntadas presents a nine-minute video, Stuttgart (for H. H.), made in 2006. Antoni Muntadas is first and foremost an observer of the contemporary world and of its form par excellence, the mass-media image: that of television, advertising and the press. Stuttgart (for H. H.) reproduces a corporate icon associated with a certain level of sophistication, mercantilism and opulence, recognisable all over the world. This logo crowns an indeterminate architectural space whilst slowly turning on its axis, as if it were a huge eye or a radar surveying its surroundings. The commercial symbol thus replaces the commemorative monument, becoming the repository of a form of collective identity associated with economic and hierarchical values.